Mudbound was already on the short list to win Best Picture at this year’s Academy Awards months before it came out, which is all the more impressive given that this film is a Netflix original, released straight to a Smart TV near you. Netflix has been steadily improving as a production company, their movies shouldering their way into the crowded party of the upper echelon, but there’s no denying that they deserve to be included. In fact, there are a handful of films from this year created by Netflix that I would include at the top of the list: The Meyerowitz Stories, Okja, Win it All, War Machine. And Mudbound joins them, surpassing most, earning every one of the bold predictions that said it would be among 2017’s strongest stories and best films. Two families coexist on a farm in rural Mississippi in the early 40s, a place where the slave/master mentality is still keeping its hold and refusing to let go. The McAllan family bought the land and have moved into a dirty farmhouse, a new situation that doesn’t please Laura McAllan, a young woman who was impressed by her strong-willed husband Henry, but who wasn’t cut out for this life. Henry’s younger brother Jamie is overseas dropping bombs on Nazis, but will return broken to this life in squalor. The Jacksons also work the land, a black family who want peace and freedom, but know the cruel hold that the white community still has over their lives. Ronsel, the eldest son, fights the Germans in tanks, and his return home brings joy to his family, but he doesn’t know what to do with his life next. When Jamie and Ronsel become unlikely friends, the progress that they saw other places abandons them, and the evil racism of their country home rears its ugly head. 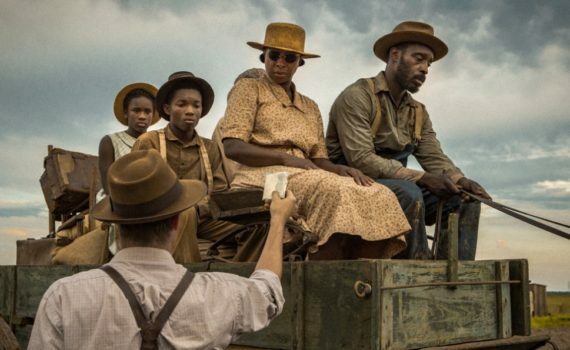 Mudbound is a special film, a powerful story that deserves all of the bold predictions it received, as well as the cliched praise that it’s likely to get. Some movies you just see coming, and this one had the feel of something important and real, a beautiful tale of family set against a backdrop of global war and local hate. It lives up to its hype, delivering a strong message that can’t possibly be ignored. I guess it’s our job as critics to think of new ways to explain how good this movie is and what it can do to those who watch it, but it’s too easy to fall back on melodramatic adjectives, especially when they all fit so well. Mudbound is excellent, it’s poetic, it’s something we need to be reminded of, while at the same time being a brand new vision brought to our screens by a combination of heart and talent. Clarke and Mulligan shine as the McAllans, but the real winner here is Rob Morgan, who does something amazing with his character and would be my pick for Best Supporting Actor if I was to cast a vote right now. Hedlund, Mitchell, Blige; these aren’t incredible actors, they don’t work magic, and perhaps that keeps the film from being the single best of the year, but it doesn’t stop it from making an impact, from stunning audiences, or from asserting itself as a real giant.